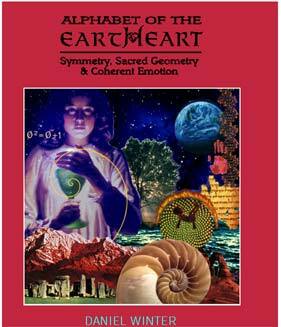 Dan Winter's second book "EarthHeart"
My name is Stephen N.. I am for my part, just another young guy trying to survive in this the strangest of times, in what seems like this the strangest of places. I was raised in a Christian family, but never really felt fulfilled or empowered because of it. The dogma and endless rhetoric always just seemed to lead in circles, and so around my 16th year i began hunting my own path. In my searching i studied everything i could find, from different forms of Christianity, to wicca, to the limited shamanic practices a kid with no computer living in the U.S. has access to. In the last few years, after attaining a computer, i have researched men like Terance McKenna and Rupert Sheldrake. I always felt a similarity with these men because of the borderline ideas they had, ideas that some men come to understand because of the use of psychedelics, not because they are an answer necessarily, but because they make a certain type of person start to recognize the patterns that this world has laid out for us. They help put us in a state of wonder, where we may realize that there is truly far more than we ever thought possible to this strange game of life. In my years of experimenting however, the initial bewilderment slowly faded off, like the moral of a story that one has learned but not applied. Everything in me was telling me that i needed to take what i had been shown and find out what it really meant, and i realized more and more that my means to enlightenment were not necessarily an end. Finally one day i happened upon an Internet Relay Chat-room entitled #Spirituality. I wandered into this room not really expecting to find anything of substance, perhaps only a few people as lost as I chatting in the lonely hours of the night. All in all i was right, the room was just a place for people somewhat like me to sit idly and chatter, luckily for me one of these people happened to be chattering about a man and his works by the name of Daniel Winters. What little i heard intrigued me, and upon clicking a link to the site www.goldenmean.info <http://www.goldenmean.info/> i realized that i had once stumbled across it before, but was not ready for the message it included. Bewildered by the amount of information the site contained, for i am not perhaps the most intellectually endowed of my generation, I wandered from page to page reading lines i did not understand. Finally i came across a collection of pages entitled "Alphabet of the EarthHeart" which was to my great delight offered free of charge. For that first gift i am immensely grateful to you and the people at soulinvitation. After delving into it I started to understand piece by piece the concepts archived on the site. The book was written well, accommodating someone of my limited knowledge on the subjects very well. Page by page i read, and many times i was forced to stop in awe as i read a line or phrase that seemed to make so much sense that i was dumbstruck as it were. It seemed that every principal filled in another little gap in the puzzle that i had been longing to solve for so long. From the lessons on the unified field, to the nature of our relationship with the living things on this earth, to the beauty of the golden mean and how the spiral appears in so many things in our reality. It was all like a song that i knew but could not remember, the tune just barely ringing in the back of my mind. Now after reading all of "Alphabet of the EarthHeart", as well as a good portion of the archived works that the people at soulinvitation have been good enough to share with those in search, including this email address which i truly hope is accurate, I find myself working toward living the beautiful principals you teach. It is truly a difficult test, living in this place, trying to follow the guidelines of a twinkling eyes lifestyle while surrounded by our governments irresponsible structuring, both physically and socially, with what seems like nothing to eat but their greasy microwaved and deep fried foods, which move closer and closer to being genetically changed for the worse. It is also hard when to get myself to a point where i could understand these principals, i used substances that in the end chain me to addiction, and deteriorate that which i have been working so hard to save. Then again, i suppose that any test worth taking must be a difficult one, and without the trial we would never learn. Suffice it to say Mr. Winter, that i for one am extremely grateful to have people such as yourself as guides through this strange adventure. I am ever grateful, and i truly hope that someday i might be able to help people understand in the way that you have helped me. May you be forever blessed for your beauty. New: Dan Winter's exquisite book "EartHeart" (book2 - read pdf at link) - NOW IN PRINT! 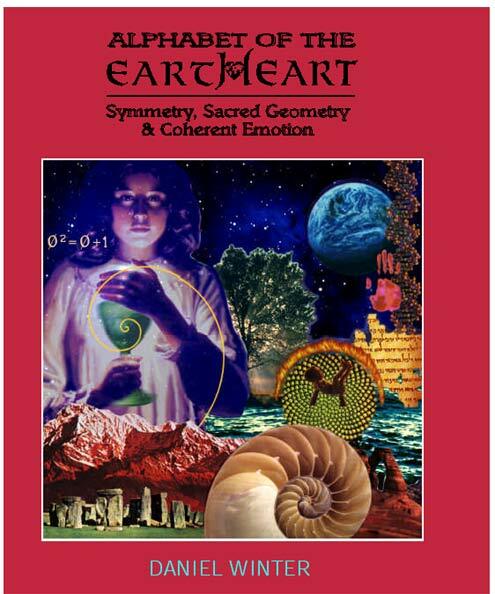 - Color front and back (cover>)300+ Pages - Beautifully Bound..
A Reader Describes reading "EartHeart": ... "one day i happened upon an Internet Relay Chat-room entitled #Spirituality. I wandered into this room not really expecting to find anything of substance, perhaps only a few people as lost as I chatting in the lonely hours of the night. All in all i was right, the room was just a place for people somewhat like me to sit idly and chatter, luckily for me one of these people happened to be chattering about a man and his works by the name of Daniel Winter. 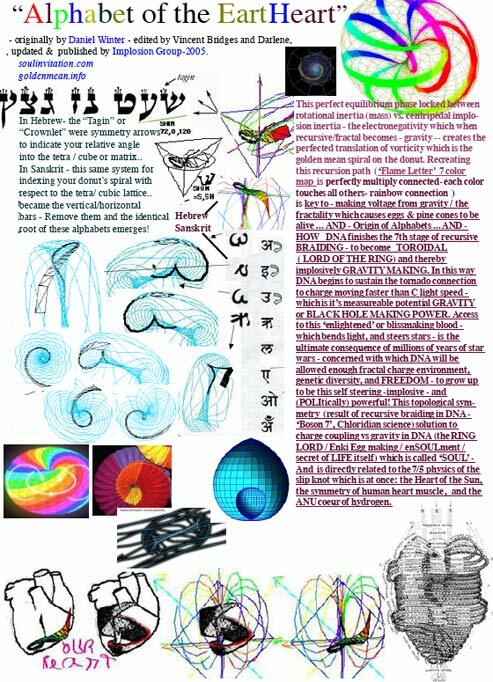 What little i heard intrigued me, and upon clicking a link to the site www.goldenmean.info <http://www.goldenmean.info/> i realized that i had once stumbled across it before, but was not ready for the message it included. Bewildered by the amount of information the site contained, for i am not perhaps the most intellectually endowed of my generation, I wandered from page to page reading lines i did not understand. Finally i came across a collection of pages entitled "Alphabet of the EarthHeart" which was to my great delight offered free of charge. For that first gift i am immensely grateful to you and the people at soulinvitation. After delving into it I started to understand piece by piece the concepts archived on the site. The book was written well, accommodating someone of my limited knowledge on the subjects very well. Page by page i read, and many times i was forced to stop in awe as i read a line or phrase that seemed to make so much sense that i was dumbstruck as it were. It seemed that every principal filled in another little gap in the puzzle that i had been longing to solve for so long. From the lessons on the unified field, to the nature of our relationship with the living things on this earth, to the beauty of the golden mean and how the spiral appears in so many things in our reality. It was all like a song that i knew but could not remember, the tune just barely ringing in the back of my mind. Now after reading all of "Alphabet of the EarthHeart", as well as a good portion of the archived works that the people at soulinvitation have been good enough to share with those in search, including this email address which i truly hope is accurate, I find myself working toward living the beautiful principals you teach. It is truly a difficult test, living in this place, trying to follow the guidelines of a twinkling eyes lifestyle while surrounded by our governments irresponsible structuring, both physically and socially, with what seems like nothing to eat but their greasy microwaved and deep fried foods, which move closer and closer to being genetically changed for the worse. It is also hard when to get myself to a point where i could understand these principals, i used substances that in the end chain me to addiction, and deteriorate that which i have been working so hard to save. Then again, i suppose that any test worth taking must be a difficult one, and without the trial we would never learn. Suffice it to say Mr. Winter, that i for one am extremely grateful to have people such as yourself as guides through this strange adventure. I am ever grateful, and i truly hope that someday i might be able to help people understand in the way that you have helped me. May you be forever blessed for your beauty. "-Stephen P. N.